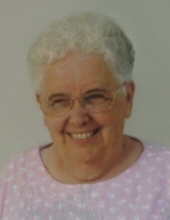 BETTY JEAN HILL-ADDINGTON, 85, of Clinton, IA, formerly of Fulton, IL, died Thursday, April 4, 2019 at the Alverno Health Care Facility in Clinton. Her funeral service will be at 10:30 a.m. Monday, April 8, 2019 at the Fulton Chapel of the Bosma-Renkes Funeral Home with Rev. Catherine Martin, Pastor of Fulton Presbyterian Church officiating. A visitation will be held from 2:00 – 5:00 p.m. Sunday, April 7, 2019 at the funeral home. Interment will be in the Fulton Township Cemetery. A memorial to the American Heart Association has been established. Betty was born April 30, 1933 in Fulton, IL to Edwin W. and Evelyn M. (Ravis) Kruse. She was educated in the Fulton grade schools and was a 1951 graduate of Fulton High School. On July 19, 1952 she married George D. Hill in Albany, IL. He died on April 10, 1975. She later married Ernest L. Addington on November 9, 1981 in Las Vega, NV. He died October 9, 1997. Betty had worked as a secretary at the Fulton High School. She then worked as a clerk for the former Woods Pharmacy in Fulton. Most recently she was a bus driver for the Riverbend School District in Fulton, retiring in 2005. Betty was a life-time member of Fulton Presbyterian Church. She enjoyed bowling, reading, yard work, attending her grandchildren's sporting events, and spending time with family. She was an avid card player, especially Euchre and Bunco. Survivors include one daughter, Lisa Hill of Jacksonville, FL; four sons, Dave (Gini) Hill of Clinton, IA, John (Laurie) Hill of Thomson, IL, Jim (Cindy) Hill of Clinton, IA and Mike (Karyn Smiddy) Hill of Albany, IL; fifteen grandchildren, Michael Hill, Susan (Keith) Conroy, Michael (Cathy) Lendman, Kelly Lendman, Emily (Travis) Bulman, Joshua Hill, Jason (Laura) Hill, Scott (Staci) Hill, Tina (Kurt) Krause, Tammy (Matt) Harvey, Joshua (Jodi) Hill, Crystal Hill, Rachael Hill, Brianna Vawter, Addison Roupe; thirty great grandchildren; five great-great grandchildren; one sister, Shirley (Richard) Schrader of Fulton. She was preceded in death by her parents; two husbands, George Hill and Ernest Addington; one daughter, Pamela Hill; one great grandchild, Brandon Krause. The family would like to thank the staff at the Alverno for their attentive care of Betty. To send flowers or a remembrance gift to the family of Betty Jean Hill-Addington, please visit our Tribute Store. "Email Address" would like to share the life celebration of Betty Jean Hill-Addington. Click on the "link" to go to share a favorite memory or leave a condolence message for the family.